This past year has been the best calender year the site has ever seen. I feel like I have really gotten into a groove when it comes to chronicling some of American’s greatest athletes, moments and milestones. I want to thank all of my followers and readers for your support that you have shown ever since I began this writing adventure in 2012. I am starting a new tradition this year. I am going to list some of my favorite articles that were published right here on AmericanSportsHistory.com. I hope you have enjoyed the site and keep coming back. Without any further ado here are my favorites from 2014! In 1947 Jackie Robinson broke the color barrier in baseball. It was a historic happening that changed professional sports forever. However Robinson was not the first African-American athlete to break the color barrier in American professional sports. In 1946 a year before Jackie Robinson made history, four African-Americans became the first to play professional football since the NFL became segregated in 1933. Those four players were Marion Motley, Bill Willis, Woody Strode and Kenny Washington. Both Motley and Willis signed with the Cleveland Browns who played in the All-American Football Conference. While Strode and Washington were signed by the Los Angeles Rams of the National Football League. Those four Men all made history that year but one man’s carrier would stand out more than all of the others, that man was Marion Motley. 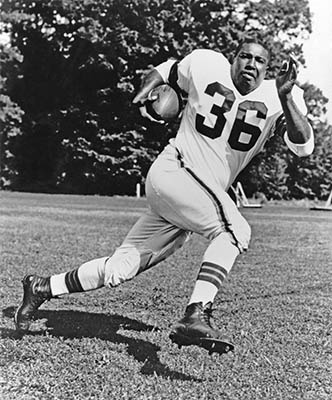 Marion Motley was born in 1920 in Leesburg, GA. He grew up in Canton, Oh and was an excellent High School football player. He would play his college career as a Full Back at the South Carolina State and the University of Nevada, Reno. He entered the US Navy in 1944 during World War II before beginning his professional carrier with the Cleveland Browns. Marion Motley stood at 6’1” and weighed 240 pounds in his prime. Regarded as the first real power back in the NFL Motley punished opposing defenses, pummeling any defender that got in his way. Many who played during his time have regarded Motley as being the best football player they have ever seen. 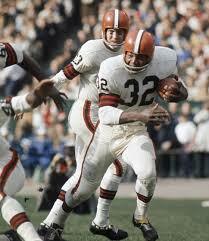 It has also been said that he was an even better player than the Hall Of Fame running back Jim Brown. Like brown he was an excellent back that could push for extra yards but he could block better than Brown, these skills made him a complete player. Marion Motley played a total of 9 seasons from 1946-1955. During this time he amassed 4,720 rushing yards and 31 touchdowns. As a receiver he had 1,107 yards and caught 7 touchdown passes. Motley was a 1950 Pro Bowler as well as a champion with the legendary Cleveland Brown’s teams of 1946-1950. He was inducted into the Pro Football Hall Of Fame in 1968, forever immortalized in his home of Canton,OH. Marion Motley was one of the greatest football players of his era and quite possibly of all time. He endured the same hate and discrimination as Jackie Robinson and was able to prove that he belong with the best. He is a true American Hero and should be known and remembered by all sports fans.